More than 700 citizens and associations once again firmly said NO to farming chinchillas for fur in Croatia! 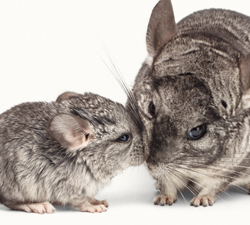 The proposal to extend the exploitation of chinchillas for an additional year was met with unanimous disapproval in a recently concluded public hearing. On behalf of the citizens, experts, institutions, and animals, on January 1, 2017, we finally rang in the fur-free Croatia after an excruciatingly long ten-year phase-out period. The interest in veganism grew exponentially in 2016. Please make the most compassionate New Year’s resolution and go vegan in 2017, for the love of animals, your health, and the planet. 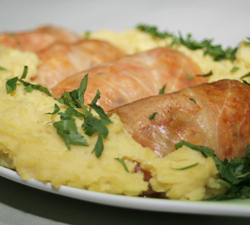 Spice up your transition to veganism with Vegan Mama’s popular vegan cabbage rolls! 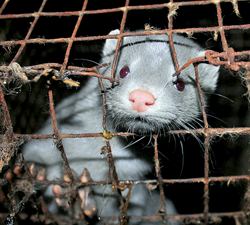 The Netherlands says NO to Fur! The legal battle between Dutch mink farmers and the state ended with the Dutch Supreme Court’s ruling in favor of the Netherlands and animals, honoring the ethical awareness of its citizens, who are against killing for fur! As a reminder, chinchilla fur farming was banned in the Netherlands in 1997. Cruelty to animals slaughtered for food is a nauseating but routine practice in Croatian meat industry, too. 2016 will stay in our memory by the shocking footage of the slaughter of a calf and cow, while dead bodies of animals in Croatian stores also carry evidence of torture. 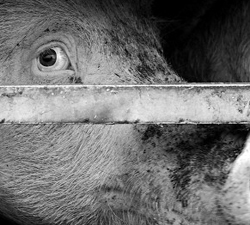 Animals raised for food lead sad lives in appalling conditions, and the easiest way to help them is to stop eating them. Every year, over a billion live birds and 37 million of other animals are exported in the EU. The animals spend days in overcrowded trucks and ships, exposed to extreme conditions and violence, just to be slaughtered at the destination. Sign the petition to ban the transportation of live animals here! 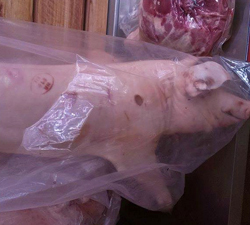 Varaždin County Veterinary Inspection promptly responded to our report and prevent a public pig slaughter by a motorcycle club from Varaždinske Toplice. We attended the launch of the booklet “Proper nutrition in Zagreb City kindergartens” that was organized by the City, with one of the topics being the importance of introducing vegan meals in kindergartens. We continued the series of lectures on animal rights for elementary schoolers titled “We are all part of the same world” with a visit to Medveščak Library in Zagreb. We sent the popular book for teens “Mom, Dad, I’m Vegan” to all major libraries in Croatia. You can still order the book for free. The leading French animal rights organization One Voice sent a letter to the Croatian Minister of Agriculture in support of the immediate enforcement of the chinchilla fur farming ban on January 1, 2017. We threw a pre-New Year’s party for our volunteers to thank all of you who have been selflessly helping us this year. Keep following our activities on our Facebook or Twitter. To get free vegan recipes, visit our Green Monday site. Thank you for offering us your support, paying membership, and getting actively involved in our work to promote animal rights!